Perfect for those who need more room or maybe sleeping accommodation. The Touring AIR Classic is available with the connecting tunnel in a left-hand (L/H) configuration for UK vehicles and right-hand (R/H) for European vehicles. 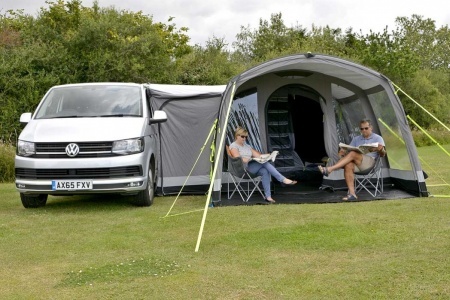 The Travel Pod Touring Air Classic VW uses Kampa's Weathershield Airflow Classic Polycotton – a breathable material that reduces condensation and helps regulate the interior temperature. The Touring AIR is designed to sit alongside your vehicle, providing the maximum amount of space without extending beyond your pitch. 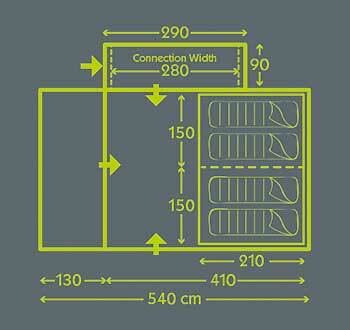 The large connecting tunnel can easily be attached to your vehicle and has a generously proportioned side door. This tunnel is spacious enough to be used for additional storage. 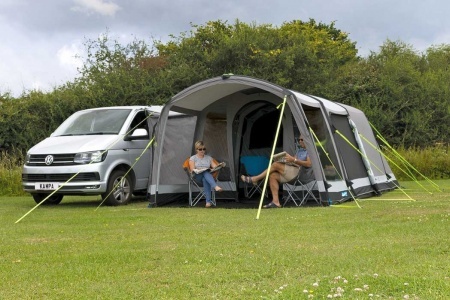 The Touring AIR also has a generous front canopy, providing protection from both good and bad weather and allows the front door to be opened when it’s raining. Once inside you’ll find a huge living space that has plenty of windows, all with zip-up blinds, and three doors, all with mosquito mesh screens. A large four berth inner tent is supplied as standard that can be used for sleeping or even storage if required. 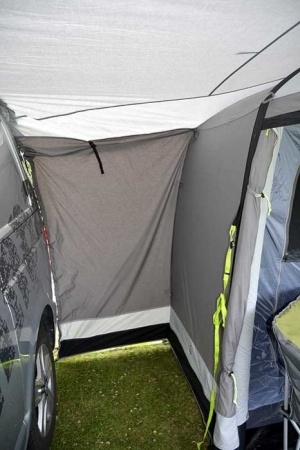 The awning is 'Sabre Link Flex' ready - that is to say, it not supplied with Kampa's Sabre Link Flex system but it is able to be fitted to the awning if you choose to do so using the velcro strips that are already in place. Sabrelink is a lighting system using strips of LED lights. These strips can be linked together and can be controlled by a remote control. As well as being able to switch the lights on and off you are also able to alter the brightness - just like a traditional dimmer switch. The Kampa Travel Pod Touring Air Classic uses an airframe ( also known as airpoles ) to replace conventional metal or fibreglass poles. Because these types of awnings are more lightweight they are generally easier to transport and position on-site than conventional awnings. The awning can be inflated quickly and easily through a single inflation point because all the poles are linked together. Additional advantages include the fact that the airframe is always attached ( no need to find or remember your poles ) and that there is less likelihood of damage to your caravan because only soft materials are fixed against it. All things considered the airframe has become the trusted and most popular choice for today's caravanners. A high volume manual pump is supplied but an optional electric pump is available to make the process of inflating the awning even easier. Drive-Away awnings offer convenience. They avoid the need to set up and take down your awning every time you wish to use your vehicle on the road. 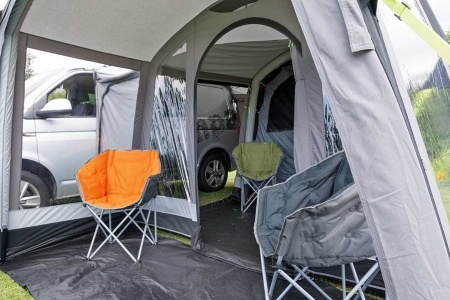 The Kampa Travel Pod Action AIR XL is a free-standing awning that enables you to drive-away and enjoy your day out. Meanwhile, your awning remains completely set-up and is ready to be simply re-attached on your return. This awning can be attached to the your vehicle by no less than four different methods giving it excellent versatility and providing you with greater choice. The Pole and Clamp Method - ( Optional Extra ) This method provides the greatest security with regard to the attachment of the awning to the vehicle and is suitable for vehicles that have a gutter running the length of the vehicle. At the rear of the awning is a tunnel that has a sleeve. This sleeve is sewn along the tunnel's length. Into this sleeve you slide a pole. The pole is placed into the vehicle's gutter and secured to the vehicle using the clamps that Kampa supply. The Beading Method - All Kampa Travel Pod awnings have a tunnel to the rear. Sewn in, along the length of this tunnel is 6mm beading. If the vehicle has an awning rail you can use this along with the beading to attach the awning to the vehicle. Alternatively, the beading can be clipped to the vehicle gutter using a 'figure of 8' profile ( not supplied ). 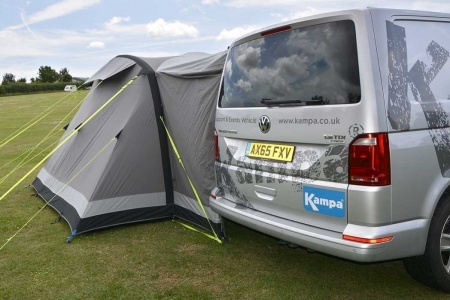 Kampa also have an optional extra, called a 'driveaway kit' that can be used for this purpose. The Guyline Method - This is generally considred to be the fastest method - so it can be very handy if you are setting up in undesirable weather conditions or not staying on the pitch for long. Firstly, attached the guylines to the top corners of the rear awning tunnel. Next, throw the guylines over the vehicle. Finally, you can either peg the guylines down or alternatively, secure them to an appropriate part of the vehicle. The Velcro Loops Method - This method is only applicable if your vehicle is fitted with roof rails. If it does, then you can use the velcro straps that are fitted along the top edge of the awning tunnel to attach the awning to your vehicle. You do this by simply fixing the velcro loops around the roof rail. Fitting to Vehicle: Very versatile. Can be fitted to your vehicle by 4 different methods. 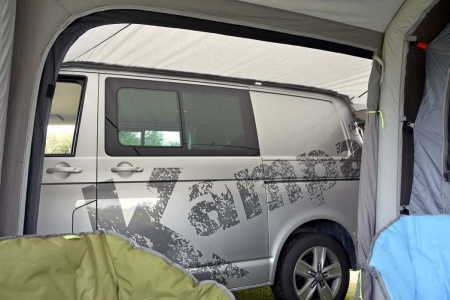 Awning Material: Weathershield 6000mm polyester - Durable and extremely weather resistant, this material's been protecting caravan and motorhomes since 2008. For 2017 Kampa have improved the coatings to make it even better.